A group of 4 or more individuals who want to set up or restructure a partnership agreement. We also have a 3 person partnership and a 2 person partnership. 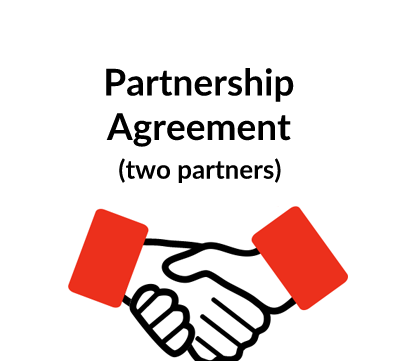 What is this Partnership Agreement for? 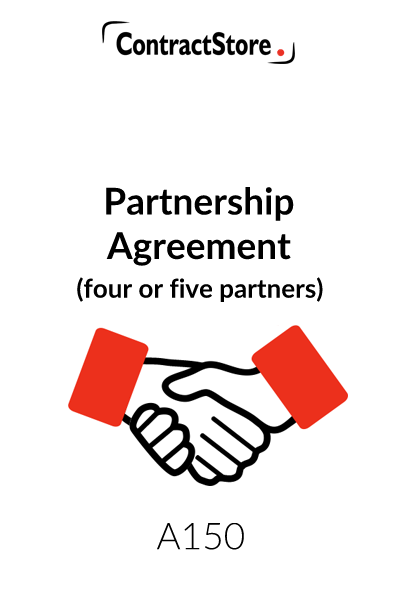 A partnership agreement is an essential document for any partnership. It sets out the rules for governance and management of the partnership business. The terms deal with partnership capital, profits and losses, drawings by partners, conduct of partnership business and decision-making. Capital and profit shares. The partnership agreement will identify the share of capital and profits that each partner has in the business. Also, it will deal with losses – usually they are in the same proportions as profits. Drawings/salary. As partners own the business, they do not get a salary. Instead, partners normally withdraw agreed amounts from the income of the business as “drawings” each month. At the end of the year the drawings will be deducted from the profit before profit is distributed. The partnership agreement will say what happens if there is not enough in the bank to pay the drawings or if a partner overdraws. Management. The agreement will set out arrangements for meetings and voting rights of the partners. Sometimes there is a core group who manage the business while other partners have a more limited right when it comes to decision-making. Partnership changes. The agreement will specify who gets to vote on introducing new partners. In a small partnership this usually means all the partners. Notice period for a partner wanting to retire will be covered as well expulsion, if a partner misbehaves. Death of a partner is also dealt with. Because capital and profits have to be paid to outgoing partners, there are often procedures for the payments to be staggered over a period. There will also be restrictions on competition for an outgoing partner. Holidays, maternity/paternity leave, sickness and other issues will also be covered: as owners, partners do not have an automatic right to the same benefits as employees. What detailed terms does the partnership agreement contain? N.B. Please note that this Agreement contains some clauses with alternative wording and some parts of the Agreement are in square brackets [ ]. It is important to ensure that the final Agreement to be signed by the partners contains only wording that is acceptable to the parties and that all alternative provisions and square brackets have been removed. Similarly, all blanks should be filled in before signature. The full names and permanent address of each partner should be inserted on Page 1. The names of the partners shall also appear on the cover page. Note that when preparing an agreement for 4 as opposed to 5 partners the reference to a fifth party must be deleted. Clause 8.4: management of partnership other than items expressly requiring unanimity; Clause 12.4: amount of reserves; Clause 12.6: change of accountant and/or accounting year; Clause 8.8 (quorum required for partnership meetings) has alternative wording dependant upon the definition of “Majority”; Clause 13.5 requires a majority to agree on granting a partner compassionate leave. In clause 3.1 the name of the business is to be inserted and in clause 3.2 the head office address should be inserted. Clause 3.3 makes it clear that the premises of the partnership (the “Property“) and office furniture and equipment is held by the partnership. Where the partnership’s premises or furniture/equipment are held in the name of one partner it is made clear that that partner holds that property in trust for the partnership. 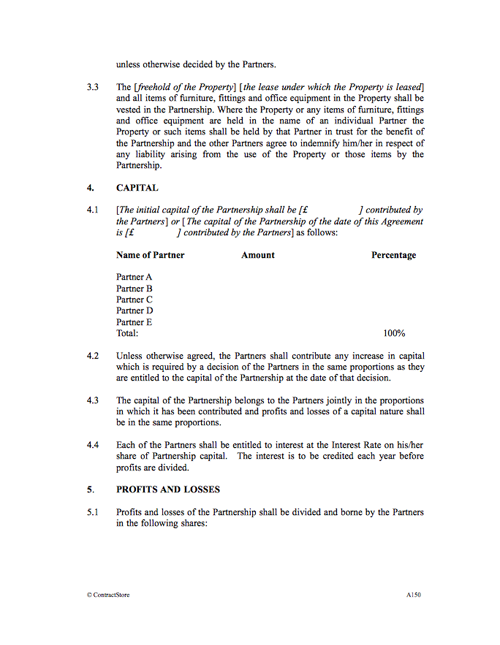 In this clause the amount of capital which each partner has to contribute should be inserted. The percentage contribution of each partner is also shown, since this can be relevant if percentages are used in relation to voting rights (see the definition of “Majority” in clause 1). Note that the table will need to be amended to delete reference to “Partner E” when preparing an agreement for 4 as opposed to 5 partners. The percentage share of each partner should be inserted in clause 5.1. Note that the table will need to be amended to delete reference to “Partner E” when preparing an agreement for 4 as opposed to 5 partners. It is usual for partnerships to arrange that each partner can withdraw a regular monthly amount on account of his share of profits similar to a monthly salary. This clause deals with this matter, and makes it clear that if there is not enough money in the account, drawings cannot be taken. Similarly, any partner who withdraws more than his profit share for a year must immediately repay the surplus – with interest if the words in square brackets are retained. Often, but not always, a partnership will retain part of its profits to meet the anticipated income tax liabilities of each partner and arrange for the partnership’s accountant to settle income tax liabilities with HM Revenue & Customs. Clause 6.4 provides that where the tax liability of an individual partner is less than anticipated the balance of any sum reserved is to be returned to that partner. Similarly where a tax rebate is received by a partner in respect of partnership profits he is obliged to repay that rebate to the partnership. 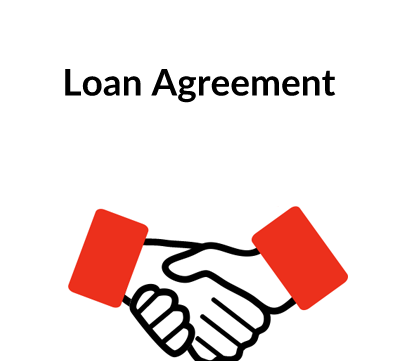 In practice, if any partner does make a loan to the partnership, it would be sensible to have a separate loan agreement dealing with these issues in more detail. Under clause 8.4 a majority vote is required for all decisions not covered by clause 8.3. See the reference to definition of Majority above. Under clause 8.9 there is potential provision for a partner to appoint another partner as his proxy, but this is not always acceptable, especially in small partnerships. This clause sets out some general obligations on the partners – to devote all their time to the business, promote the partnership, etc. Note that disagreements as to the reserves are to be settled by a Majority vote (clause 12.4) whilst replacement of the partnership’s accountants or changes to the partnership’s accounting year may either be decided by a Majority or by unanimity (clause 12.6), whichever option you select. Relevant details need to be inserted here. In addition to annual holidays, this clause covers the possibility of a partner taking maternity, paternity or adoption leave. While employees have a statutory right to such leave, the law does not apply to partners so we have provided for the partnership to establish its own policy – to cover both the period of the leave and the financial implications. We also have a clause here dealing with compassionate leave – e.g. when a parent or spouse of a partner dies. A fairly long notice period, usually at least six months, and sometimes as long as a year, is customary, when a partner wishes to leave. For accounting reasons, it is helpful for the date of a partner’s retirement to coincide with the date of the end of the accounting year. A compulsory retirement age is covered under clause 15.2. Careful thought needs to be given to the selection of a compulsory retirement age as the partnership may face a claim for age discrimination. As a general rule we do not advise opting for a compulsory retirement age under clause 65. A “Boilerplate” clause which deals with the possibility of one of the terms becoming invalid for some reason. . For information on Boilerplate Clauses see our Free Document Z159. Each partner should sign the Agreement in the presence of an independent witness. If every partner wants a signed copy, four/five copies of the Agreement in its final form should be prepared and all four/five copies signed by the four or five partners (as appropriate) and witnessed. Note that when preparing an agreement for 4 as opposed to 5 partners the reference to the fifth partner and witness must be deleted.